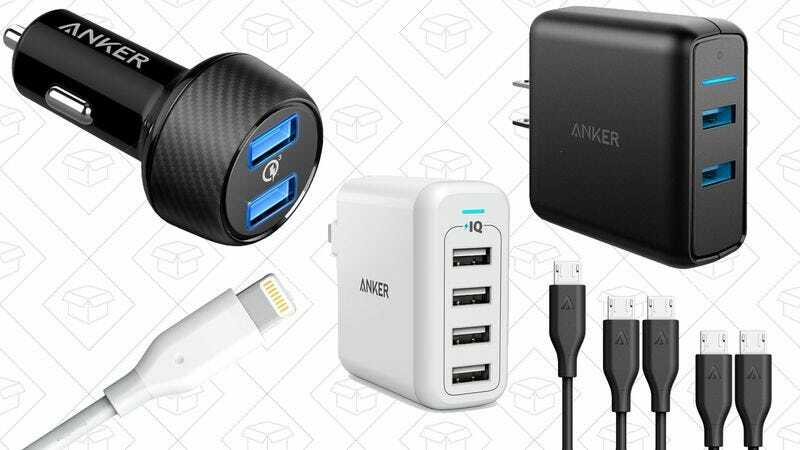 Anker makes basically all of your favorite charging gear, and a bunch of it is on sale in today’s Amazon Gold Box. If you read Kinja Deals, you know that Anker runs its fair share of sales. But these discounts are uncommonly good, befitting their Gold Box status. For starters, you can pick up a pair of Quick Charge 3.0 chargers: One for your car, and one for the wall. If you don’t need Quick Charge capabilities, the PowerPort 4 is a fantastic travel charger, stuffing four high-speed ports into a device that plugs directly into the wall. And since you can never have enough charging cables, grab some kevlar-reinforced Anker PowerLine Lightning and microUSB cables. Bonus: While there aren’t any battery packs in the Gold Box, you can save 15 percent on the just-released PowerCore II 10000 with promo code SLIMQUIK. This battery uses a proprietary Anker chipset to deliver the fastest possible charge to all devices from a single port, including Quick Charge 3.0-compatible phones. The TiVo for cord cutters comes with lifetime service and a 1TB hard drive, and Amazon’s offering the first deal we’ve ever seen on it today. The original Roamio OTA sold for $50 with a 500GB hard drive, but you had to pay $15 per month for the TiVo service. The new model though comes with 1TB of space, and usually retails for $350-$400 upfront, with lifetime service. Assuming you’ll use it for more than a couple years, that’s a good deal on its face, but Amazon’s knocking it down to just $308 right now, while supplies last. Phone cameras will never have true interchangeable lenses, but you can still take fisheye, wide angle, and macro photos with this three-in-one clip-on lens kit from Anker. Be sure to check out the sample photos uploaded by customers to get an idea of what this kit is capable of. Plus, if you live in a city with Amazon Prime Fresh, buying the wand will get you a 90 day trial membership, so you can fully immerse yourself in Amazon’s lazy vision of the future. The Dremel 3000 features a variable speed motor that can spin anywhere from 5,000 to 35,000 RPM, and includes 28 accessories to get you started with projects all around the house. Just remember that this is a Gold Box deal, meaning this price is only available today, or until sold out. As part of the same Gold Box deal, you can also score a 70-piece accessory kit and carrying case for $30, an all-time low. Amazon sample boxes are one of the only good things to come out of 2016, and they’re back at it again with a $10 box full of men’s grooming gear, plus a $10 credit to spend on over 130 select men’s grooming products on your next order. Assuming you use the credit, that basically means you got eight or more name-brand products for free. Fantastic Beasts And Where To Find Them wasn’t exactly magical, but Harry Potter completionists will want to own it anyway, and it’s already down to $12 complete with a digital copy.